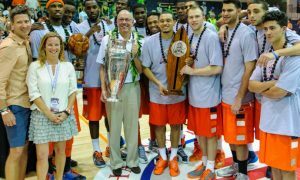 Bernie Fine Won’t Be Charged: Did Syracuse Act Too Soon in Firing Him? How are we all supposed to feel? Bernie will not be brought up on any charges. The investigation is over, and the feds will not ring him up. But the stain on his reputation is forever. His coaching legacy obviously tarnished. He is without a job, and much ability to live a normal life (at least in CNY). The university says it was right in firing Bernie last year. But John Wallace says he feels vindicated, ecstatic and happy that Fine was never found guilty in a court of law. Can it be both? Can SU have done the right thing, even if Fine is not technically guilty of anything? An employer has the right to terminate employment if the employee is damaging their business in any way. And there’s no doubt the soap opera that surrounded Fine’s history and relationships were rocking the university in a way never before seen. Employment is not always a virtuous bond. Companies do not necessarily need to stand with morality or the idea of doing what’s “right” in its business dealings. It would be a nice world if it worked this way. But it’s not the real world. Corporations have decisions to make based on profit, brand and PR. Many times, individuals get run over by this Mack truck of the bottom line. Essentially, keeping Fine employed or standing in support of him through the investigation and as the controversy brewed would’ve hurt the Syracuse in many regards. Keeping him on payroll (or the bench) would’ve only ratcheted up the heat and fervor on a program that was chasing a title. It would’ve continued to strangle the student-athletes that had nothing to do with it. It would’ve dragged Syracuse University through the same muck of Penn State, when obviously it’s clear they were two completely different entities. It’s a harsh reality, but it’s earnest. The Fine Scandal brushed aside old buried cobwebs, and showed us the massive dysfunction in his family. It doesn’t appear it was the extent of the original allegations, but the Fine clan clearly had closets full of skeletons. ESPN and Mark Schwartz should feel hollow and guiltty for chasing ratings and sensationalism with its handling of the information. And Bernie can feel some degree of vindication with this decision. But he needed to be removed by SU. He had become a giant anchor on the program. Fine’s background was an old dark place that needed to have some light shined on it. And Syracuse needed reason for space from that. In the end it was the right decision, no matter today’s findings.